Lights Off, Eyes Open: New Moon Darkens Skies For Meteor Shower : The Two-Way The Lyrids aren't known for their flashy shows, but this year they're getting some help. The height of the showers is expected Sunday morning before dawn, and darker skies will make viewing more exciting. A composite of Lyrids over Huntsville, Ala., in 2009. 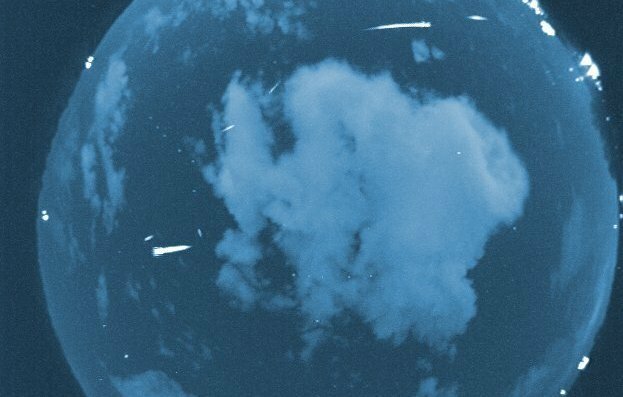 This year, the meteor shower will hit its peak before dawn Sunday morning. Tonight is a good night for a meteor shower. The Lyrids aren't known for their flashy shows, but this year they're getting help from a new moon. The dark skies will be "ideal for meteor watching from the ground," NASA says. Kelly Beatty, senior contributing editor for Sky and Telescope magazine, tells Weekend Edition host Scott Simon the best views are from the darkest places. "For every bright [meteor] you see, there will be many more faint ones, and to see the faint ones, you need a dark sky," he says. The relatively feeble light of a new moon will help hopeful meteor-watchers across the continent. "Although ordinarily you might see one every five minutes or so, it's not unprecedented to see ... 40 or 50 an hour." According to a Chinese chronicle, in 687 B.C. Lyrid meteors "dropped down like rain," Sky and Telescope reports. The height of the shower is expected at about 1 or 2 a.m. EDT, according to the magazine. If you're standing outside, Beatty says the key is to turn your gaze to where it's darkest. "But if you trace them back, they'll all appear to come from the constellation Lyra, which is rising over the eastern horizon in late evening ... and as Lyra gets higher up in the sky, the meteors should become a little bit more plentiful." "All other things being equal, the farther away from the [point of origin] a meteor streaks, the longer its trail will be." If you're not up for standing outside in the middle of the night, NASA will have a live video feed embedded on its site, along with a Web chat with three NASA meteor experts from 11 p.m. to 5 a.m. EDT. During the chat, NASA says, they will cross-compare images from meteor cameras on the ground with images from a video camera attached to a rubber balloon, equipped with a GPS tracking system. NASA says the hope for the flying camera, which will be launched by middle- and high-schoolers in Bishop, Calif., is to record meteors "from a vantage point well above the clouds." "While not expected, the team hopes for the good luck to capture both a balloon-cam view and an meteor camera view of the same meteor, providing an unique perspective." After about 2.5 hours, NASA says the balloon is expected to rise high enough that the atmospheric pressure will pop it, releasing a parachute that will float the camera back to Earth. "There's a comet called Thatcher, which last came through this region of the solar system in 1861, and it's in an orbit that lasts more than 300 years. As it goes around, it spreads out debris, kind of like dust coming off of a truck, and it spreads around its orbit, and every April we plow through those little dust particles." Those bits of dust are traveling fast, Beatty says, hitting the atmosphere at about 30 miles per second. They transfer all that energy to the air molecules around them. "They get heated up to thousands of degrees, and that's that super hot air that gives off the light, more than the little particle itself," he says. All meteor showers, Beatty says, are the result of Earth crossing the path of various comets. The next shower to mark on your calendar is on May 5, according to a schedule of 2012 showers from Sky and Telescope. That shower will be brought to you by the better-known Halley's Comet, although a full moon accompanies it this year.